This article is from the WSSF 2006 AFRMA Rat & Mouse Tales news-magazine. I was very quickly distracted by the story. I am an individual who is very much a rat enthusiast. My heart seems to be endlessly in love with animals and rats are the angels who continue to pull on my heart the most. 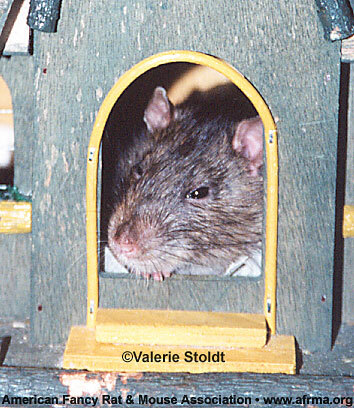 Rats are the underdogs of the pet world. 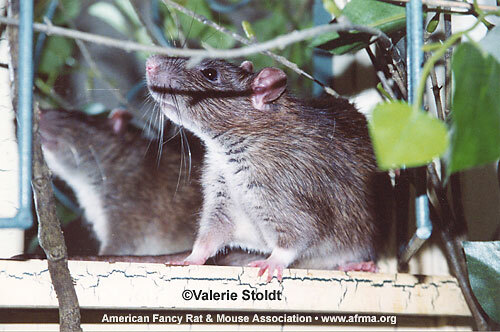 There are numerous agencies willing to assist almost any other species of pet, but rats? Only those involved in the species seems to be aware of their value and needs. 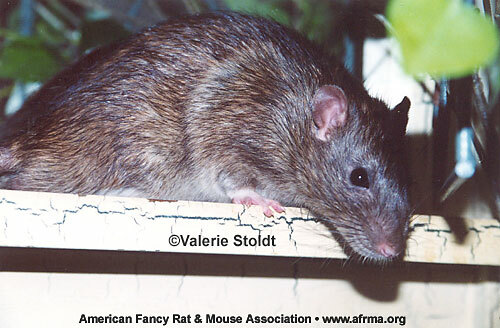 Only those who have come to know rats have learned of their intelligence, love, and if one should be so fortunate, amazing attachment to his or her caretaker. It became clear then that Tripod had found a home. Tripod came home on August 11, 2002. I remember Karen telling me to make sure that Tripod would be kept in an area where he would not have to jump and everything would be easily accessible for him. Well, apparently someone neglected to inform Tripod of his handicap because he sure did not miss out on anything. He was just as fast as the others and climbed everything more than any of the others. He was an amazing animal. He was this adorable Agouti fur piece (because one could see no legs as he passed) that would go zooming by. As soon as this little angel was received home, he followed me everywhere. I would let him roam my apartment, but he was always right by my feet. When I would stop walking, he would reach up with his front paws and gently tickle my ankles. As I looked down I would see this sweet face begging me to pick him up and pet him and scratch him. Tripod would get an itch and try to scratch it with a leg he did not have. I would always scratch it for him and just like a dog, Tripod would quickly rotate the portion of his femur that he had as if he were scratching the itch himself. Tripod would simultaneously lick my fingers in gratitude. One could see the appreciation in his sweet face. His attachment to me was incredible, but it had a dark side. As I had seen once before with my Lillie, sometimes an animal is so attached to its owner that it will fight viciously to protect that relationship. Tripod was just such an animal. It took a year to finally get him socialized with my other males and he did not allow newcomers. I took what would have been deadly attacks on a rat with my own hand on numerous occasions. Eventually the others learned to simply stay away from Tripod and Tripod did his own thing. All was well among my angels. Tripod knew he was loved, and I knew he understood this love. Tripod with his legless side. This didn’t impair his ability to climb and play. On a day trip one afternoon I happened upon a stand selling little wooden houses. I had to buy one for my “kids.” Tripod took to the house and made it his. It was perfect for him; just enough room for one male rat to fit comfortably, and Tripod was very much into being comfortable. When Tripod was out for play, if he was not scooting by at the speed of rat, climbing something, or following me, he could be found resting in the house. Tripod loved that house; one could see it in his face. Tripod was at peace in the house. Sometime around April 2004, I noticed signs of aging in my Tripod. His fur was thinning and graying slightly, and he was losing weight. His appetite was as good ever though, and I made extra efforts to see that he had plenty of food. After arriving home from a night of dancing one Saturday night, I brought Tripod into the bedroom while I prepared for bed. I held him and petted him on the bed until I fell asleep. I woke up early in the morning realizing that I had dozed off and he had left the bed. I searched the room for him and found him warm; but, my sweet Tripod had just passed away. At least my beloved Tripod spent his last hours in my loving care and passed away playing as he so loved to do. There is a special bond with these animals that is even more intensified when it is an angel with special needs. The neediest of the angels know when someone extends themselves to help fill the needs he or she cannot. Tripod was a precious, beautiful, and wonderful life, as well as a dear, sweet, special friend.